Vote for Lindsey Stirling and Mark Ballas! Looking forward to watching Mark Ballas and Lindsey Stirling dance on Dancing With the Stars? If so, remember they will not get to keep dancing without the help of the fans. Not familiar with the show? Here is some basic information about how the show works and how you can keep Team Stark dancing! The couples dance on Monday nights for a score from the judges. Then the fans vote for their favorite. The judges’ score counts 50% and the fans 50%. The key to the judges’ score is that they convert it to a percentage. They take all the scores from the judges and add them together. Then that number is divided into the score for the individual couple. That gives the 50% that counts as the judges’ scores. Same thing with the fan vote. All the votes are totaled and that number is divided into the couples fan vote. The lowest combined judges scores and fan scores send a couple home. There will be three ways to vote an account. Each week the number of votes per account will change. Week one there will be thirteen contestants, so you can vote thirteen times per account. Week three it will be eleven votes per account. Once the competition gets down to five competitors, the vote will stay at five votes per account for the rest of the season. You may vote an account by calling, voting on Facebook or voting online. The first is by phone. The voting number for Team Stark is 1-800-868-3407. The number will remain the same throughout the competition. Phone lines open as soon as the show starts and stay open for one hour after the show ends for each time zone. You can only phone vote during this time frame for your time zone. For example: New York residents would phone vote from 8PM-11PM EST. California residents can not phone vote until the show is on in their time zone. Fans should be encouraged to phone vote as soon as the show starts. After they dance and at end of the show are the hardest times to get through and we want every single vote. You can vote on as many phones as you have access to. The final way is online. In order to vote online, you must have an account. Fans go to http://abc.go.com/shows/dancing-with-the-stars/. At the top of the page in small print is a place that says Join. Click on this and it will walk you through the process of making an account. Fans should make their accounts before the show starts because when the show is going the site crawls. There is no limit to how many online accounts you may have, but each must be attached to a valid email. Voting times for online voting are 8PM EST on Monday to 8PM EST on Tuesday. Once you make the account you will have to go to the email you listed and verify the account. Each account must have a separate valid email attached. This will validate your account. You now have an account valid for voting. On voting night you will click on the voting tab and enter your email address for the account and password and will be allowed to vote. If you vote multiple accounts you will probably have to clear cookies or your cache after approximately 15 accounts in order to continue voting. So that’s how you do it! Season 25 is going to be a very competitive season! Please keep Team Stark dancing by sending votes their way! Get to know a little about Team Stark-Lindsey Stirling and Mark Ballas! The full cast for Dancing With the Stars season 25 was announced today on Good Morning America. Two time winner Mark Ballas is returning after a very successful run on Broadway as Frankie Valli. He will be partnered with violinist Lindsey Stirling. Lindsey is known for her innovative music and doing choreographed moves as she plays. Dancing With the Stars premieres Monday September 18 and 8:00pm EST. This morning the pros for season 25 of Dancing With the Stars were announced on Good Morning America. After a two season absence, two time Mirror Ball Trophy winner and fan favorite Mark will be returning to the ballroom. Mark joined the cast of Good Morning America for the live announcement. He stated he has missed being creative and his friends, and is looking forward to using his creative side again! The celebrity cast members will be announced September 6. Mark Ballas and BC Jean, otherwise known as Alexander Jean, released the Making of High Enough today. The documentary gives fans behind the scenes looks at how the EP was made and their experiences in England. 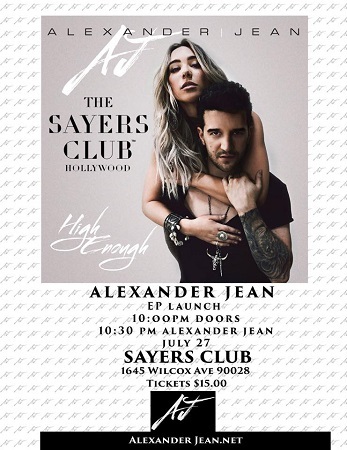 Alexander Jean, otherwise known as Mark Ballas and BC Jean will celebrate the release of their new EP Head High with a party at The Sayers Club in Los Angeles. Doors open at 10PM with Alexander Jean performing at 10:30PM. After the show they will be selling hard copies of the EP and signing autographs!